We continue our trip on the shores of history but remain in Egypt. This time let me introduce you to a game whose name and rules have also been forgotten among the mists of the past. It is known as the game of "Dogs and Jackals." We know of it by way of a famous boardgame found in an Egyptian tomb. It belongs to a family of games named "game of the thirty points" or "game of the fifty eight holes". Many gameboards or pieces of gameboards have been discovered in Egypt but also in Palestine, Mesopotamia and Assyria. A very nice boardgame has been found in the tomb of Reny-Seneb, XII dynasty, about 1800 BC. This beautiful game in ebony and ivory, has the shape of a small piece of furniture. The gameboard is a rectangular (15x10cm) wooden box, put on four animal legs. 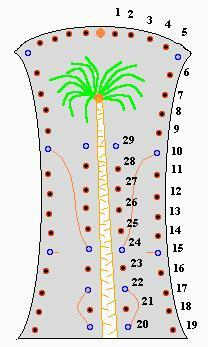 The top in ivory is carved with a palm tree and fifty eight holes. Schematic drawing of the gameboard. In the drawer within the box, ten pawns were found. They look like short sticks, five carved with a dog head and five with a jackal head. The pawns were placed in the holes of the gameboard, they certainly describe a trail that the pawns have to follow. Holes showings marks (15), circles, or inlays might have played a special role in the course of the game. Were the lines between 10 and 24, or 20 and 22 some shortcuts ? The game is for two players. Five dogs are given to one and five jackals to the other. You will need three pieces of money to use to determine movement. The goal is to reach the five points (25 to 29) on your side of the board and win the dates. Both players agree on a stake. The right side of the board belongs to the dogs and the left to the jackals. The brown circle above the palm tree is the starting point. 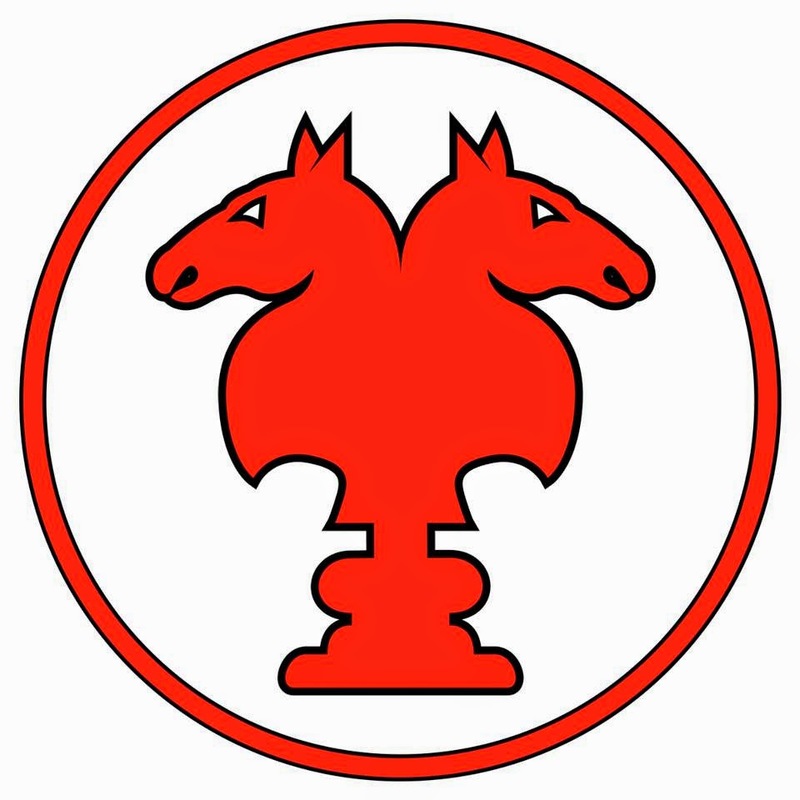 The pawns move then on the side of the gameboard trying to reach the top of the tree (25 to 29). Exact throws are required to reach the final positions. The order in which it is done has no importance. The two players throw the three coins in turn. A five is required to introduce a new pawn on the starting point. Then the pieces are thrown again to move the pawn. The first pawn to reach a hole with an horizontal mark (15 on dog side) wins the stake. Only one pawn may be put on a hole. If no move is possible the throw is lost for this player. If a pawn reaches a hole linked to an other hole by a path (10-24, 20-22), it follows the line which acts like a ladder to the victory. A player must move his pawns when he can do so. If he can move no pawns, his or her opponent is allowed to add his throw to his or her own . The first player having put his five pawns in the five holes (25 to 29) wins the game.